DeFacto partners up with Visual Retailing to improve their global visual merchandising and retail efforts. We are proud to announce that prominent Turkey-based omnichannel fashion retailer DeFacto has chosen Visual Retailing's suite of industry-leading technology to power up their global retailing efforts across their 350 stores worldwide. Seeing the huge value of technology when it comes to managing large product inventories across hundreds of retail locations, DeFacto called on Visual Retailing’s decades of industry expertise and line of technology products for a variety of objectives. As well as improving the direction and consistency of their visual merchandising efforts, DeFacto needed to significantly reduce the time spent communicating visual merchandising directives. They also needed a much more effective method of standardizing their stores at cluster level along with the ability to view, sort and manage product range data from their vast collection of stylish, ready-to-wear fashion. 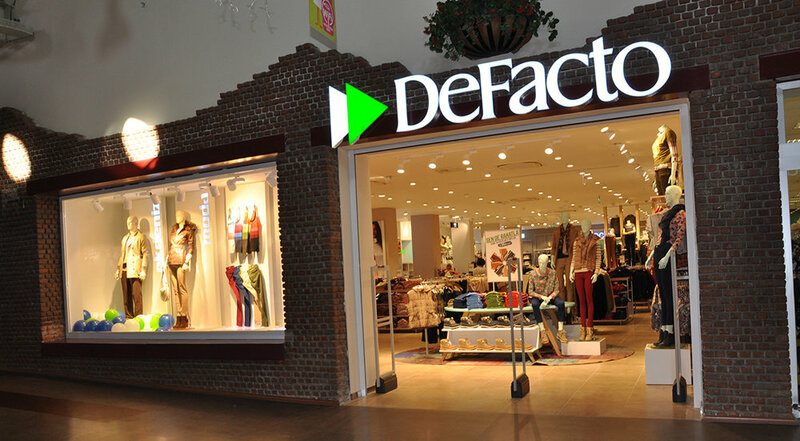 With more than 350 stores currently operating — both domestic and overseas — DeFacto’s mission to ensure their visual merchandising is universally compliant, maintaining the same consistency and brand appeal across each of their locations, is a key reason in their decision to partner with Visual Retailing. expanding our global efforts in the way we always imagined." Mr Merrick added: "Because DeFacto has a vast catalogue of ready to wear, Visual Retailing’s software is also being used by us to create visual reports of product range data, allowing us to simply and effectively perform visual assortment planning and receive up to date reports within seconds." Through using Mockshop — one of Visual Retailing’s flagship products — DeFacto can visualize their entire product lines in an easily manageable perspective. They can then create smart, interactive 3D renderings of their shop floors to ensure that the layout of their stores at cluster level is consistent and enhances DeFacto's already strong brand presence. From this, DeFacto can now shorten the time taken to create and send planograms and visual merchandising directives to their stores. This means that each of their stores again maintains a superb level of consistency and compliance is made much easier. Mockshop’s functionality also acts to improve the communication processes between DeFacto’s retail locations as each directive contains clear, visual merchandising guidelines that can easily be followed by store managers and merchandisers without confusion or extra time spent organising — leaving them more time to make their stores look and feel great. brings, is a very exciting time for us as we look to help [DeFacto] grow even more. We’re proud to help them realise their great ambitions." Alongside DeFacto, leading retailers such as Marks and Spencer, Macy’s, Splash, Iconic, Meraas and hundreds of brands across the world — including adidas, S. Oliver & Tommy Hilfiger to name a few — are already using Visual Retailing’s software to speed up and maximize the efficiency of their retail workflow practices and improve the consistency of their visual merchandising efforts. DeFacto was established in 2003 and started retailing operations with the first store opened in 2004. Since the day it was established, DeFacto has been carrying out its investments with the vision of becoming a global “affordable fashion” brand and has become a success story thanks to the correct business model it adopted. As of today, DeFacto has been providing services through 297 domestic stores and 58 foreign stores, progressing rapidly on the way to become a global brand. In addition to physical stores, an e-commerce website at the address www.defacto.com.tr was also opened in consideration of the developing technology and changing consumer needs — eCommerce being considered as one of the strategic priorities and a key area of investment. In its global pathway, the company determined the following goals for the next decade: In 2025, becoming a fashion brand that operates in 50 countries through physical stores and in 100 countries through eCommerce. Visual Retailing BV was founded in 2004 by its management to help retailers optimize their workflow and visual merchandising processes through a combination of proprietary technology and software products. Based in Haarlem, The Netherlands, the company develops a suite of visual technology solutions such as Mockshop and Shopshape — and also StyleShoots, the world’s first all-in-one product photography machines for eCommerce — to improve and harmonize retail processes from content production to 3D shop layouts and visual merchandising across stores. With decades of combined experience in the retail industry, Visual Retailing BV operates worldwide, servicing retailers and brands such as Marks and Spencer, Tchibo, adidas, Landmark Group, Tommy Hilfiger, Asda, Columbia Sportswear and more.